We can resize 99% of all the rings in store. It only takes 2-3 days extra and it's at no extra cost. So focus on finding a ring that you will love to wear. On the check-out page enter in the re-size. Easy! Enjoy shopping! Here's the TOP 4 reasons why these people bought opal Jewellery from us. 1) It was the perfect "special" item to help them show their partner or a family member how much they love them (birthday, anniversary, engagement etc). 2) It was the perfect item to buy for themself as a way uplift how they were feeling when they looked at it. 4) Opal is Australia's national gemstone - countless people buy opals to give as a gift when they go overseas. 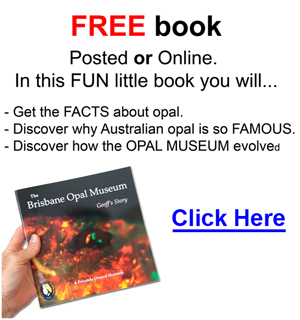 You can explore the Opal Museum and Shop in the Virtual Tour Below.. Your Opal jewellery will be delivered to you in one of these this gorgeous wood jewellery boxes and you will also receive a little information pack about your opal, guaranteeing that it is 100% natural.